Countertops can be made from countless materials, from Stainless Steel to Quartz. Below are some of the most common countertop materials with maintenance/cleaning recommendations and guides for each. Bronze and Brass are strong, durable, and reactive metals that will form a patina over time. Many bronze or brass countertops do not come with any protective coatings or lacquers, allowing their “living finish” to develop and change throughout the lifetime of the top. Slight imperfections are to be expected in your bronze or brass countertop – it is not meant to represent a perfect, solid surface. These imperfections are what add to the classic country charm that is characteristic of these countertops. Care and maintenance of your bronze countertop will be dependent upon its finish. Use Windex or other non-abrasive cleaners for regular cleaning. Do not leave water standing or liquids for any extended period of time to prevent marks or drinks rings, and clean up spills as soon as possible. To maintain your mirror-polished finish, treat with a standard metal polish like Noxon, or polish the top with a solution of lemon juice and salt: take the juice of one lemon and add salt to form a saturated liquid. Rub the liquid over the bronze with a paper towel, and rinse off with warm water. Scrub with a 4/0 steel wool, rub dry, and spot clean with a metal polish. To renew the finish of mirror-polished bronze/brass, use an automotive compound with a machine-polishing pad. This finish requires special care as the patina is a very thin coating that can be easily removed. Windex or soap and water can be used for daily cleaning. Protect your bronze countertops by using trivets for hot plates and cutting boards for chopping. Light scratches and mineral streaking can be brushed out using a household 3M Scotch-Brite pad. Deep scratches may be sanded out using sandpaper grades from 150 to 220 and buffed with a 3M Scotch-Brite pad – however, this may remove the patina that has developed. The patina will return, but in a different pattern. Acidic items, like lemon juice, will also remove the patina. Bronze’s living finish will change with wear, tear, and time. This creates a unique pattern of use that cannot be intentionally recreated. If you experience any difficulties with your countertop, always be sure to reach out to your countertop provider for additional assistance. As concrete ages, it will subtly change. Sometimes colors can deepen and intensify. This soft patina of age will make your artwork a more personal, one of a kind creation. Giving your concrete the appropriate care ensures that it will stay beautiful for years to come. Sealers are used to protect concrete from acids, oils, etc. A penetrating sealer will flow into the concrete’s pores and seal them, and a topical sealer will leave a coating or film on top of the concrete, creating a physical barrier between the concrete and contaminants. As these sealers allow for a small amount of vapor transfer, temporary darkening can occur when the surface becomes moist. This is normal and will dry to its natural color. Concrete, especially new concrete, is more porous than some other natural stones, so it’s important to stay on top of spills. Light oils and other liquids have a small molecular profile and are therefore able to penetrate many surfaces, including concrete. Sealers are designed to resist oils and water but also have vapor permeability to allow for proper curing. Therefore if liquid is left on the countertops for too long, it can leave an enhanced patina. Clean spills as soon as possible to avoid permanent staining! Concrete’s curing mechanism is alkali in nature, so acids can etch the surface. They are generally sealed against this possibility but it is still wise to clean up wine, vinegar, lemon juice, etc. in a timely manner. Avoid setting hot pans on counters as they can damage the sealer. Concrete countertops should not be used as a cutting board. It can dull your knives and cut through the sealer. Mild soap in warm water makes a good cleaner for your concrete. Use a dishrag or sponge and avoid scouring pads. Cleaners containing abrasives, bleach and ammonia should be avoided. Neutral pH cleaners can be used as they do not react with sealers and are widely available. Some suitable cleaners include Simple Green, Ivory White, or Doctor Bronners Castile soap. Copper is a reactive metal that has a reddish-brown color when matte and will develop a distinctive brick-colored patina over time. This patina will continue to evolve throughout the lifetime of the product. Slight imperfections are to be expected in your copper countertop. It is not meant to represent a perfect, uniform surface. These imperfections are what add to the Old-World charm that is so characteristic of copper countertops. Care and maintenance of your copper countertop will be dependent upon its finish. For daily cleaning of all copper finishes, use Windex or mild soap and water, and wipe up all liquids with paper towels. Many owners choose to let a patina develop on copper. This emphasizes the “Old World Charm” of copper countertops. Deep scratches may be sanded out using sandpaper grades going from 150 to 220 and buffed with a 3M Scotch-Brite pad. Brush the countertop in a circular pattern to recreate its original finish. For white marks or rings, scrub the countertop lightly with diluted vinegar using a 3M Scotch-Brite pad and rinse with water. Mirror-Polished copper may be treated with a standard metal polish like Noxon. Another option is to polish the top with a solution using lemon juice and salt. Take the juice of one lemon and add salt to form a saturated liquid. Rub the liquid over the copper with a paper towel and rinse off with warm water. To renew the finish of mirror-polished copper, use an automotive compound with a machine polishing pad. This finish requires special care. The patina is a very thin coating that can be easily removed. Windex or soap and water are great for day to day cleanings. Protect your copper countertops by using trivets for hot plates, use cutting boards for chopping. Wipe up any liquids or spills promptly to prevent spotting and glass rings. Patina finishes have NO protective coatings. Sanding or buffing will remove scratches but will also remove the patina. The patina will return, but in a different pattern. Copper’s distinctive patina will develop over time. It may take up to a year to develop its full look. Acidic items, like lemon juice, will remove the patina. Copper’s living finish will change with wear, tear, and time. This creates a unique pattern of use that cannot be intentionally recreated. Edge Grain wood countertops are constructed of random wood members and may display a variety of grain patterns and colors – this is normal. There is no specific finish on the natural wood surface. Sealing and oiling your countertop allows you to do food prep and chop directly on the surface. The oils are food grade and safe for consumption. Chopping directly on the surface will create a “pattern of use” that is part of the look for this type of wood worktop. Edge Grain countertops require regular oiling to keep them in stable condition and to prevent drying, cracking and splitting. Undue drying or lack of oiling will cause dramatic cracking and checking. Be sure to oil your countertop by pouring a liberal amount of food-safe Butcher Block oil onto the countertop and letting it soak for 20 minutes. Remove the excess oil with a paper towel and buff. End grain wood countertops are traditional Butcher Blocks. Their cut-and-chop surfaces are perfect for food preparation. Wood countertops are sanitary products, with inherent properties to prevent bacterial build-up. Over time, your top will develop a unique pattern of use based on your cutting and chopping habits. End Grain Countertops gain and lose moisture easily and react to their environments. A certain amount of checking and cracking is normal in this type of worktop, especially on very thick countertops. To maintain moisture, apply food-safe Butcher Block oil to your countertop after 30 days, and then once seasonally (every three months) thereafter. To oil, pour a liberal amount of food-safe Butcher Block oil onto the countertop and letting it soak for 20 minutes. Remove the excess oil with a paper towel and buff. Cracking and splitting is a natural occurrence and is to be expected due to drying and movement of the wood. This is especially common in very large tops. Your top may be cleaned using Windex, washed with soap and water, or disinfected using Clorox. In addition to being unique and colorful, gemstone countertops are also heat-resistant and stain resistant. 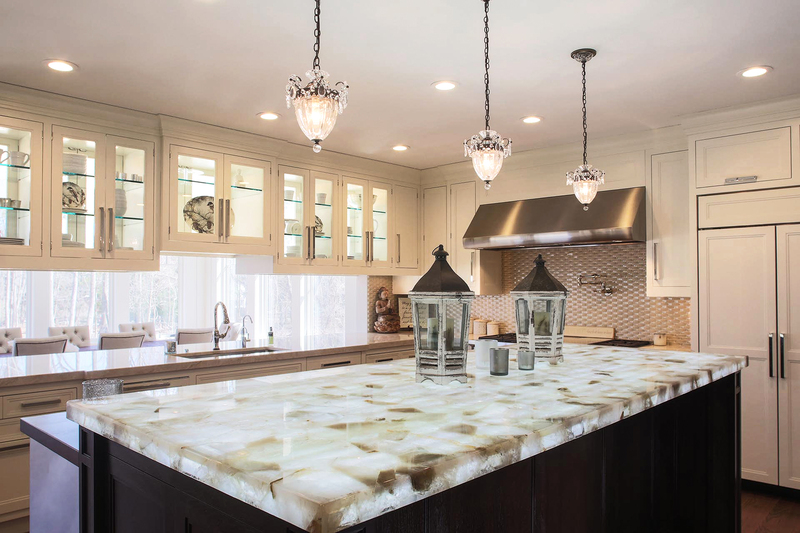 Most homeowners will use these exotic stones as an eye-catching showpiece. Countertops, vanities, shelves, and even framed art are just some of the more common applications for these spectacular stones. Some types of gemstones have semi-translucent properties and can be backlit to create a stunning focal point. Clean with warm-water or mild detergent cleanup with a soft, white cloth. Any mild cleaner or detergent can be used on stubborn stains. To remove adhered materials like food, gum, and nail polish first scrape away the excess with a plastic putty knife. Then wipe away with denatured alcohol to remove stubborn marks. However, the surface should be rinsed with water immediately. Traditional granite countertops have a high-end aesthetic appeal that will add value to your home while also providing an extremely durable surface. Granite is a natural stone, which makes each piece one of a kind. The appearance and versatility of granite have made it a very popular choice for homeowners. Granite countertops deliver gorgeous aesthetics in the kitchen and bathroom and have other good qualities. Granite is very hard substance and is not susceptible to scratches. It will take normal wear and tear very well and also resists heat, which makes it ideal to use near a range or a cooktop. When you have set down a hot pan fast, granite can take the heat without being damaged or weakened. Granite can be very resistant to stains and won’t absorb liquids when properly sealed. In the bathroom, placing a hair tool on it that is still warm won’t be a problem. It is important that granite countertops are sealed correctly and are resealed immediately if necessary. Glassos is a quartz based surface material made from a proprietary blend of quartz powder and other fine minerals. Advanced technology is used to fuse the mixture together at high temperature forming pure white slabs of extreme hardness and classic beauty. Glassos requires very little maintenance -no sealer is required and it will never yellow or stain. Avoid placing heavy or abrasive objects on your Glassos surface without adequate protection, and always use a cutting board. You may clean Glassos with a soft cloth or paper towel and glass cleaner . Do not use abrasive household surface cleaners or abrasive sponges. Glassos may also be cleaned just as engineered stone is cleaned – with a non-ammonia based soap and water. This material is one of the most aesthetically pleasing stones due to the fact that it brings a warm, inviting look to any application. This material lends itself to a classic old-world look with a modern feel. Limestone is very popular among the design community as it is wonderful at reflecting light and making rooms appear brighter. Limestone is often used for facades, stairs, and decorative pieces. Limestone has a low abrasion resistance rating, so be very cautious with heavy items in the kitchen such as pots, pans, or mugs to avoid chipping or cracking the stone. To reduce the appearance of staining, always wipe up spills immediately. Oil and highly pigmented liquids can penetrate and stain the stone. Keep acidic foods such as lemons or tomatoes from direct contact with Limestone, as it will acid etch when exposed to acidic foods. Always use a neutral detergent to clean limestone. With its timeless look, this natural stone will bring an element of class to any space in the home. Most marble is white with gray veins, but there are other, more exotic colorations to this beautiful natural stone. In addition to its lavish appearance it can also increase the value of a home. It makes a good surface for bathrooms, offices, fireplace surrounds and other locations where they don’t get heavy use. Marble is heat resistant and stands up well to hot pots and pans in the kitchen. Marble is more porous than granite so it more readily absorbs liquids. Oil, wine, juice and other spills can penetrate deeper into the stone quickly, so it is important to avoid spills and to wipe them up immediately if they should occur to minimize the appearances of staining. Marble can and should be sealed when installed and again every few years. Avoid any exposure to acidic foods such as lemons or tomatoes, as all marble will acid etch when exposed to acidity. Marble can become scratched or chipped – do not bring sharp knives into contact with the marble and be cautious with heavy pots or mugs to avoid chipping or cracking. There is no denying the sheer beauty of onyx. It comes in a variety of colors along with contrasting colors from the veining. These color schemes make each piece a unique piece of art. Some colors of onyx are translucent and can be backlit. All onyx has naturally occurring cracks and fissures. To reduce the appearance of staining, always wipe up spills immediately – oil and highly pigmented liquids can penetrate and stain the stone. Keep acidic foods such as lemons or tomatoes from direct contact with Onyx, as it will acid etch when exposed to acidic foods. Pewter is a very soft but durable metal that acquires a living finish and changes with time. An excellent alternative to stone countertops, this artisanal metal gives a distinctive bistro look when in the hands of the right craftsmen. Imperfections, including slight scratches, pinholes, and soldering marks can be expected on your pewter countertop. They help create the country charm of this rustic metal. Hammered and textured pewter products will have a wavy, undulated surface and will not be machine flat. 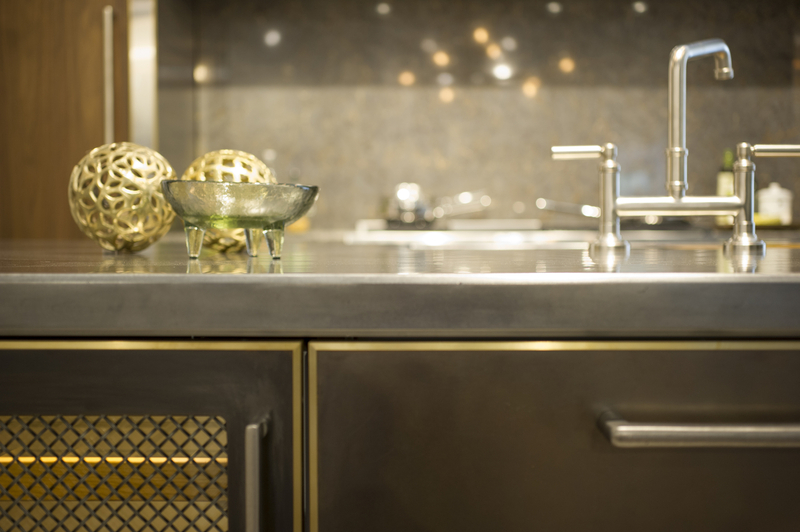 Care and maintenance of your Pewter countertop will be dependent upon its finish. For daily cleaning of all Pewter finishes, use Windex or mild soap and water, and wipe up all liquids with paper towels. Many owners choose to let a patina develop on copper. This enhances the “bistro” or “country” flavor of the countertop. Mirror-Polished pewter may be treated with a standard metal polish like Noxon. To renew the finish of mirror-polished pewter, use an automotive compound with a machine-polishing pad. This finish requires special care. The patina is a very thin coating that can be easily removed. Windex or soap and water are great for day to day cleanings. Protect your pewter countertops by using trivets for hot plates, use cutting boards for chopping. Wipe up any liquids or spills promptly to prevent spotting and glass rings. Patina finishes have NO protective coatings. Sanding or buffing will remove scratches but will also remove the patina. The patina will return, but in a different pattern. Pewter’s distinctive patina will develop over time. It may take up to a year to develop its full look. Acidic items, like lemon juice, will remove the patina. Pewter’s living finish will change with wear, tear, and time. This creates a unique pattern of use that cannot be intentionally recreated. Porcelain is durable, versatile, and low-maintenance. These countertops last a long time due to the high strength of the material. Thin slabs offer versatility: because the slabs are so thin and lightweight, they work well as backsplashes and other wall panels, panels for the sides of cabinetry or kitchen islands and as decorative accents throughout the home. The glaze on the porcelain produces a waterproof surface that is very easy to clean. Warm-water or mild detergent cleanup with a soft, white cloth is all that is usually required to maintain a clean, hygienic surface. This material is naturally strong and heat-resistant. Quartzite has a beautiful and decorative sparkling pattern and an appearance that is comparable to marble. This material is relatively new for countertop use, but due to its durability and alluring features it is quickly becoming very popular. Quartzite is hard, heat-resistant, and has low porosity; therefore it is hard to stain. Engineered stone, also known as quartz, is practically maintenance-free. This kind of stone does not require any sealing, and it is resistant to stains, acid, scratches and heat. Available in many colors and patterns, quartz has become a very popular countertop option. Quartz is non-porous so it resists staining much better than granite, marble and concrete. It stands up to juice, oil, wine, tomato, coffee and other sources of stains in the kitchen. For cleanliness, a non-porous surface means that it will not harbor bacteria or viruses. Standard Plank wood countertops are made from random wood members, measuring 3”-6” in width. You can expect to see some tight knots, light grain sapwood, and pith marks in these planks; this is normal and acceptable for this style of countertop. Standard Plank countertops are coated in a Waterlox finish and are available in natural color only; there is no staining on this style of countertop. Apply an all-natural wood furniture cream once a month as per the directions on the bottle, and buff with a clean, dry, cotton cloth. When the finish has aged, seems too dull, or has been worn through, you can clean the tops with Murphy’s Oil Soap and recoat with Waterlox Brand Wood Finish. Clean your plank wood countertop using Windex or soap and water. Scrub lightly using a 3M Scotch-Brite pad. A sleek and contemporary material long used by “professional” kitchens, stainless steel is a very durable material that is easy to clean and will not react with most household items. Pads – use a random or circular motion to blend. Deep scratches may be sanded through using sandpaper grades up to 220 and buffed with a 3M Scotch-Brite pad. When buffing, use a circular pattern for a #4 finish or a straight motion for a machine brush finish. Mirror polished stainless may be serviced using an automotive compound and a machine- polishing pad. For daily cleaning, use Windex, Fantastic, Formula 409, or any mild dishwashing liquid. Highly stain-resistant and bacteria resistant, soapstone commonly comes in a range of grey colors from light to dark. It is very nonporous and is far less likely to stain when wine or oil is spilled on it. It stands up well to acidic materials, such as lemon juice. This stone is also heat-resistant and patinas with time. Rule of thumb. Use mineral oil once a week for a month, once a month for a year, and then yearly to maintain even finish. Use mineral oil once a week for a month, once a month for a year, and then yearly to maintain even finish. Periodic application of mineral oil will also help your soap stone develop a dark patina and will enhance the natural aging process of your soapstone. As this stone is fairly soft avoid cutting directly on it and be careful not to drop heavy glass objects or cast iron pans to avoid scratches and chips. Because it is nonporous, it cleans up with mild soap and a sponge or dish rag. This is a very sanitary countertop and great for those who enjoy cooking with fresh fruits, vegetables, and meats that are sometimes associated with e-coli bacteria. Slate is a natural, fine-grained rock that naturally has an uneven surface which many people find aesthetically appealing. Slate has a full matte finish and comes in a variety of colors, mostly medium to dark tones. Slate is nonporous, which means that it cleans up very easily and does not have a tendency to harbor bacteria. It won’t absorb liquids, so you won’t get any staining from juice, tomato products, oil, cleaners, etc., since they can’t penetrate the surface. The hardness and durability of slate is also very appealing in the kitchen or bathroom. It won’t easily chip or scratch, and it stands up very well to heat – hot pans or hair tools won’t mar the surface. Zinc is a reactive metal that starts with a distinctive blue-gray hue and will develop a hazy- gray patina over time. This patina will continue to evolve throughout the lifetime of the product. Imperfections, including slight scratches, pinholes, and soldering marks can be expected on your zinc countertop. They help create the country charm of this rustic metal. Hammered and textured zinc products will have a wavy, undulated surface and will not be machine flat. Care and maintenance of your Zinc countertop will be dependent upon its finish. For daily cleaning of all Zinc finishes, use Windex or mild soap and water, and wipe up all liquids with paper towels. Many owners choose to let a patina develop on copper. This enhances the “industrial” or “country” flavor of the countertop.